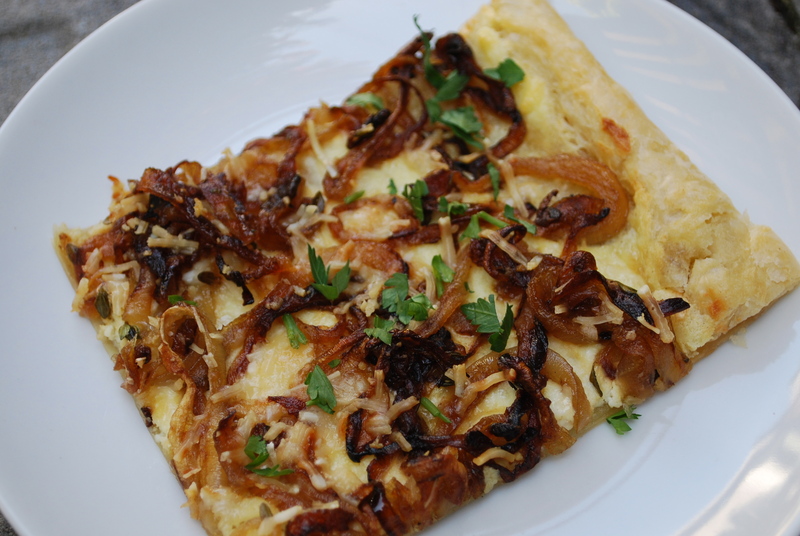 Caramelized Onion Ricotta Tart | Time to Cook! This is my “go to” hors d’oeuvre to serve with cocktails. It’s light and fresh tasting and I think it’s nice to serve people something warm out of the oven. When thawing my puff pastry, I do set a kitchen timer for the thawing time (40 minutes) on the counter (if you let it sit much longer than that, it can get sticky and really hard to handle and mess up your whole recipe). I’ve heard you can also thaw it in the fridge, but I haven’t tried that yet. Recipe from blog Annie’s Eats. Preheat the oven to 350° F. In a medium saucepan set over medium heat, melt the butter. Add the sliced onion, thyme, sugar, salt, pepper and white wine to the pan. Cook, stirring occasionally, until the onions have fully caramelized and are golden brown in color, about 20-25 minutes. Remove from the heat and set aside. In a small bowl whisk together the ricotta and egg yolk until smooth. To assemble the tart, lay the puff pastry sheet on a baking sheet and fold in each edge about 1 inch. Spread the ricotta mixture over the puff pastry (you may not use it all). Sprinkle about half of the Parmesan cheese over the ricotta mixture. Layer the caramelized onions evenly over the ricotta mixture. Top with the remaining Parmesan. Bake 25-30 minutes, until the puff pastry is golden and baked through. Garnish with fresh parsley, if desired. Slice into squares or rectangles and serve warm.